“Interesting” salads are not exactly what Italian food is famous for, I know. However, some time in the 1980es, when I was a high school student, many firms and stores in Italy gave up the traditional long midday break, and large salads with more than just vegetables started popping up in the local trattorias as a quick and healthy lunch option. The other day I posted instructions for grilling vegetables, and since these keep so well I couldn’t resist giving you an idea of what you could do with them, besides serving them as a side. Peel the garlic, and place it (whole or minced, it's up to you ) in a cup with the oil, rosemary, salt and pepper. Allow to rest for a few hours. 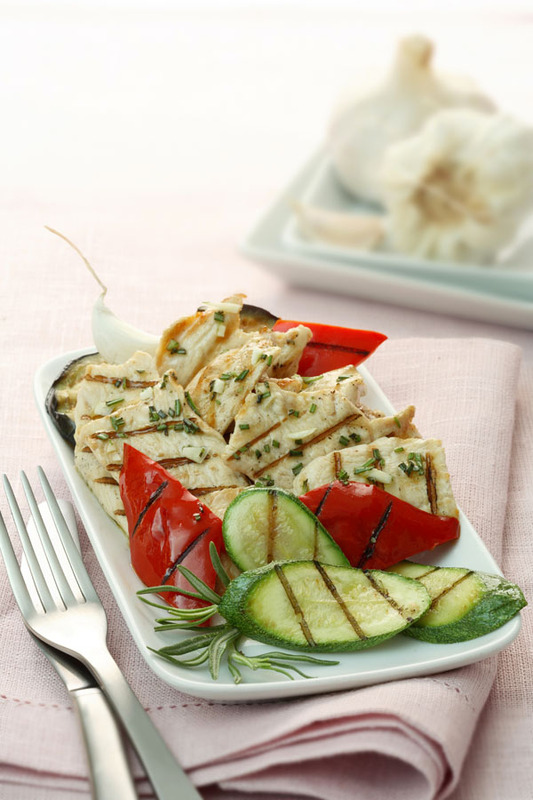 Cut the chicken breast into chunks or strips. Cut the eggplant into 1/2" slices (with a mandolin) sprinkle them with coarse salt and place them in a colander in your sink for at least 30 mins. to sweat out any bitter juices. Seed the pepper, remove any white membranes, and cut it into slices. Slice the zucchini sideways, thinner than the eggplant. After 30 minutes of salting, rinse the eggplant slices well and pat them dry with paper towel. Remove the crust from the bread, cut it into cubes, and toast it in the oven for about 5 minutes or until golden. Grill the chicken and the vegetables on a cast iron grill pan or on the barbecue, one type at a time (see my post on grilled vegetables for different cooking times and temperatures), brushing them with the prepared oil and turning them only once or twice. 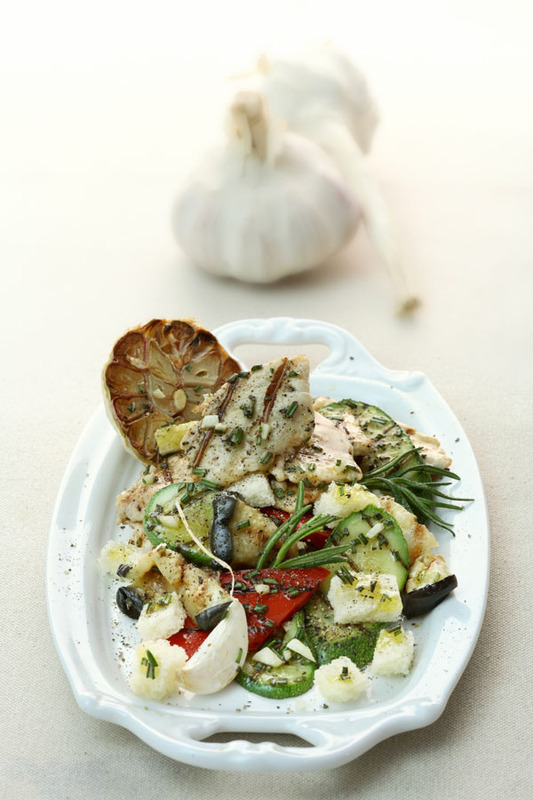 Arrange in a platter and serve warm, with the toasted bread cubes, and drizzled with the remaining flavored oil. Hey, I was just thinking that I need to lose a couple of pounds before the summer! So glad to see you are posting some light recipes for those of us not blessed with your svelte figure! Although I am not dieting at the moment, I LOVE light recipes, especially ones that are good to take to work for lunch, etc. I can’t wait to make this! this is what I make for many, many dinners. I love how light and flavorful this is. What a great idea! I always find chicken breast too bland when compared to dark meat, but of course it’s leaner and healthier… maybe pairing it with smokey roasted veggies will make it more interesting! Trying this tomorrow. I know Jo Ann, I would also rather eat dark meat! The only way I really like light meat is cut very thin. I pound it and make it into scaloppine. 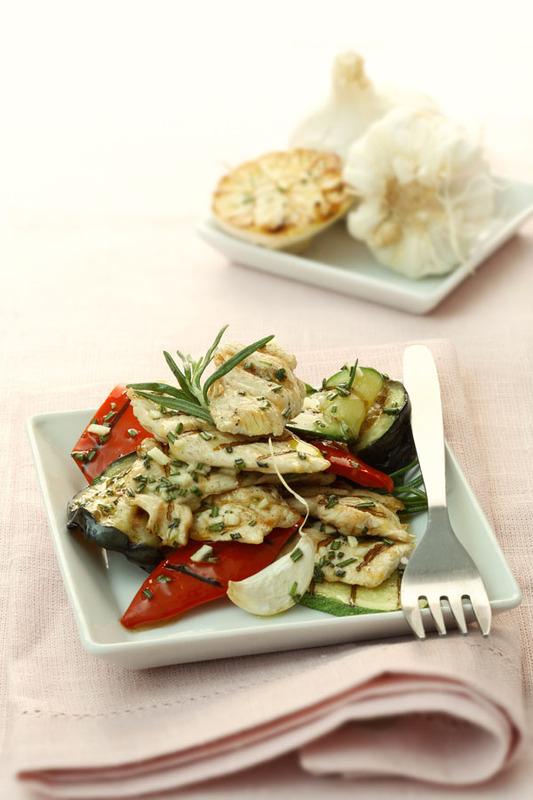 I also like to serve my grilled vegetables with chicken or turkey,and I should copy this beautiful presentation! Beautiful grill marks and that garlic looks awesome too. the tricks for nice grill marks is not moving the stuff too much. just set it on the grill until you need to turn it. the lazier, the better! Gorgeous vegetable display!!! So creative ! These “interesting” salads are what Ed and I eat as dinner for a good part of the summer. So fresh, simple stuff with good vinaigrette. What could be better! This looks like it should be served in a restaurant. I am loving the grill marks! I also love that it is not the standard version of a chicken salad – there is no lettuce! I would eat this everyday! Looks so good. Healthy and filling!